Maracaibo, Venezuela's second-largest city, sits up in the north-west of the country in Zulia state and started its life as a trading post in the 16th century, when it was actually founded no less than three times. A viable alternative to Caracas (the federal capital), Maracaibo has a lakeshore setting and is big in the world of Venezuelan tourism. In 1914, the discovery of oil beneath Lake Maracaibo transformed the city's status virtually overnight and this new-found wealth resulted in rapid growth and much expansion. Over the past decades, the city has been spruced up by the powers that be and has lots of well-maintained parks, shopping malls and hotels, and several unique tourist attractions. The downtown area is relatively compact, making getting about on foot quite feasible, and there is a major highway in from Caracas (roughly six hours away), as well as an airport (La Chinita International). Tourist information about Maracaibo is best obtained from your hotel, although you may also like to visit the tourism outlets of Corpozulia (Corporacion de Desarrollo de la Region Zuliana) to the north of the historic centre, on the Avenida Bella Vista, and Corzutur (Corporacion Zuliana de Turismo) to the north-west, on the corner of Calle 78 and the Avenida 18. Officially named the Lago de Maracaibo, this vast brackish lake is actually linked to the Gulf of Venezuela on its northerly side, making it more of a bay than a lake. The lagoon is so large that if it was a true lake, it would be the biggest in the whole of South America. Geological finds have shown that the Lago de Maracaibo dates back some 30 million years and today comes with literally hundreds of islands. Boat trips of the lake are readily to hand, along with fishing trips. For the best lake views, take a drive along the General Rafael Urdaneta Bridge. More information about Lake Maracaibo. Tourists on holiday in Maracaibo will find plenty of attractions to occupy themselves, with a leisurely stroll around the Old Town and the colonial streets being recommended, together with the stylish Paseo de las Ciensas. The Calle Carabobo is particularly interesting, with its brightly painted houses and grilled windows, while the wooden houses within the Santa Rosa de Agua district and the buildings around Santa Lucia are also quite special. With average daytime temperatures regularly topping 30°C / 86°F, the extremely family friendly Aquamania water park offers a fun way to keep cool, with its water slides, inflatables and lazy river. Aquamania is based within the Path of the Lake Park (Vereda del Lago) and is accompanied by a small zoo, with the park itself coming with plenty of shady places where you can hang out and relax. On the northern side of central Maracaibo, La Marina Park (Parque La Marina) is another popular recreational space, with its towering observation deck and pathways. Within close proximity to the airport, the Botanical Gardens (Jardin Botanico) lie in the suburb of Granja Santa Ana, providing a further green space. If you are looking for entertainment, then options include the Centro Sambil Maracaibo complex, the Baralt Theatre (Teatro Baralt) and the José Pachencho Romero Stadium (Estadio José Pachencho Romero), where various sporting events and football matches take place. More information about Maracaibo Tourist Attractions. Those planning to spend their time sightseeing and exploring the main landmarks of Maracaibo will be able to choose between churches, basilicas, palaces and public squares. Typically Venezuelan, Maracaibo has its own Bolivar Square (Plaza Bolivar), where many of its most important buildings live, such as the Casa Morales (Casa de la Capitulacion), the city's Cathedral (Catedral) and the Government Palace (Palacio de Gobierno). Also in the vicinity is the rather iconic Basilica of Our Lady of Chiquinquira (Basilica de Chiquinquira), which stands on the western side of the Paseo de las Ciencias, where it was built in the 1830s and honours Zulia's patron saint, the Virgin of Chiquinquira (La Chinita). The basilica fronts the Plaza of the Virgin of Chiquinquira and All Saints (Plaza de la Virgen de Chiquinquira y Todos los Santos), a central park with plenty of seating and people-watching opportunities. More information about Maracaibo Landmarks and Monuments. The city contains several reasonable museums and galleries, suiting those looking for information about Maracaibo's history, lake and artists. At the Lake Bridge Museum (Conoce Tu Museo Puente), the lakeside panoramas are perhaps more enticing than the exhibits themselves and rather steal the show. Celebrating the life of famed hero General Rafael Urdaneta is the Urdaneta Museum (Museo Urdaneta), where a collection of memorabilia remembers the Spanish American Wars of Independence. For modern art in Maracaibo, both the Museum of Contemporary Art of Zulia (Museo de Arte Contemporaneo del Zulia - MACZUL) and the Lis Bermudez Fine Arts Centre (Centro de Arte de Maracaibo Lia Bermudez) will more than oblige. More information about Maracaibo Museums. Lake Maracaibo is at the heart of Zulia state, with the city itself residing on its north-western coast. Many day trips around Zulia and beyond are quite possible from Maracaibo, with a number of enticing islands based around the lake, generally being located within the Almirante Padilla municipality and including those of Los Pájaros, Maraca, Pescadores, Providencia, Sabaneta de Montiel, San Bernardo, San Carlos, Toas and Zapara. San Carlos Island (Isla de San Carlos) is especially appealing to tourists, with its Castillo de San Carlos fortress being constructed in the 1670s to guard the entrance to the lake. The stilt houses (palafitos) on the shoreline of the Laguna de Sinamaica are a real must-see and at little more than an hour away, this is one excursion that should not be overlooked. Others include the Oriental Coast (Costa Oriental) and the Catatumbo Swamp National Park (Parque Nacional Cienagas del Catatumbo). At just under three hours away and to the south, a weekend break in the city of Merida may tempt tourists looking to try their hand at the outdoor activities clustered around the Pico Bolivar mountain. 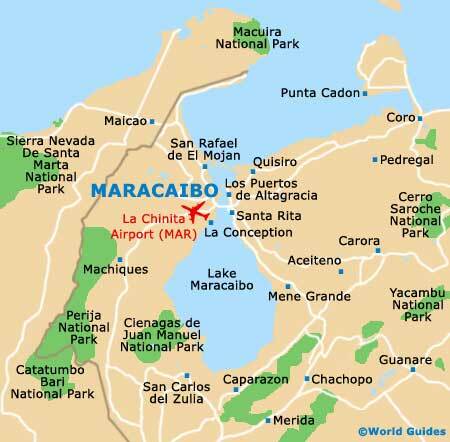 More information about Maracaibo Attractions Nearby.